Over the past few years Miranda Carter has been quietly pioneering a series of Sunday afternoon events at York Hall in Bethnal Green. In the past these events have featured maybe six or seven bouts, however her latest offering, which takes place this coming Sunday, is far from low key affair, instead entering the mega event zone with a fourteen bout card. The event, titled Rolling Thunder, heavily features fighters from Johnny Eames famous Canning Town fight factory - the TRAD TKO Boxing Gym. Originally the event was to feature just three of the East London trained stars but after Butch Lesley had to withdraw from the original headlining British Masters title bout with Menay Edwards, this was increased to five, including the new headlining bout, a rematch between Hackbridge, Surrey’s Danny Connor and Ely, Cambridgshires Tyler Goodjohn, this time for the British Masters Welterweight title. Last time these two met, back in March last year, Goodjohn came out on top, however things may be a little different this time around, as Connor has really turned his career around, racking up five top class wins out of six outing. Goodjohn on the other hand has had just two wins out of three, and the loss was a brutal knockout dished out by the forceful hands of Vinny Woolford in November last year. Heading up the support is Connors TRAD TKO gym mate, former British Cruiserweight Champion Leon Solid Williams, who will be making his first appearance since the shock loss of his coveted Lonsdale belt back in January. Surprisingly Williams isn’t looking for an easy fight, to ease himself back, oh no the man nicknamed Solid is so determined to get back on the Championship trail that he has elected to face Lithuania’s #1 ranked Remigijus Ziausys. Also on the support card is rising Cruiserweight star Menay Edwards, who will be making his first outing under the TRAD TKO banner. Edwards, whose record stands at 7-1, will be looking to impress, against unbeaten Lawrence Bennett, in order to earn the right for a tilt at the Southern Area title later this year. Making his debut at the event is yet another TRAD TKO newbie, Eric “Congo Warrior” Mokonzo, who will be receiving a baptism of fire at the hands of Hayes hardman Darren McKenna. Former World amateur #2 female boxer Areti Mastrodouka is the fifth of the TRAD TKO squad that will take part in the Rolling Thunder event. In her debut, at Miranda Carter’s March 2012 event, Mastrodouka put on a stylish display to beat Kristine Shergold by a 60-55 points margin. On the 20th May, 36 year old Mastrodouka is set to face a much younger opponent in 20 year old Latvian #1 ranked featherweight Julija Cvetkova. Of the non-TRAD TKO contingent, the pick of the bunch sees Epsom, Surrey’s unbeaten Middleweight J.M. Coyle face a stern test, as he takes on Wickford, Essex hardman Danny Brown. Coyle may have the unbeaten record but Brown will be no walk over especially as he’ll be looking to extend his excellent run of a win and a draw against previously unbeaten opponents so far in 2012. Another potential cracker sees two unbeaten fighters, Light Welterweights Luke Fowler and John Brennan, battle it out. Also on the card are unbeaten foursome, Upminster Lightweight Ryan Taylor, Stratford Super Middleweight Scott Hartley, Luton Light Welterweight Danny Mulhern and Kensington Middleweight Daley Ojuederie, who will be joined by debutantes, Bexleyheath Lightweight Jack Dishart, Middleweight Alex McKay and Tilbury Welterweight Matt McCarthy - who are all against yet to be named opponents. 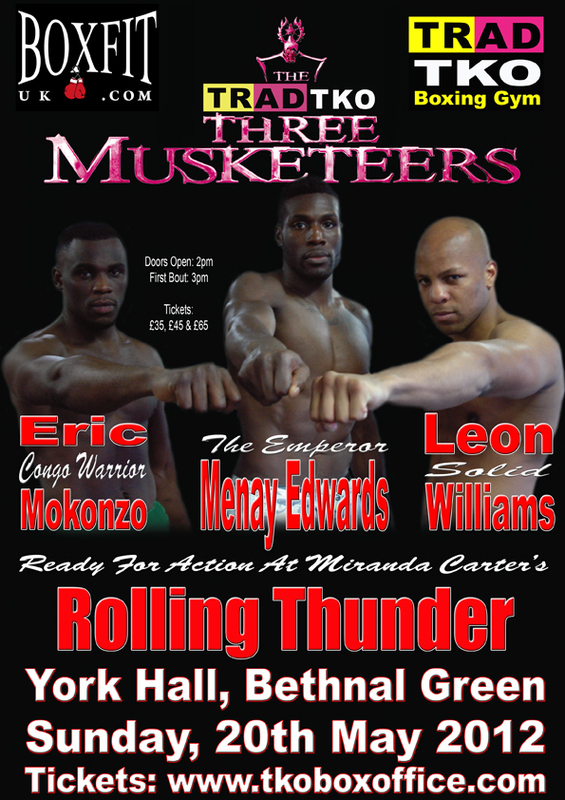 Tickets for Rolling Thunder, featuring the TRAD TKO five, Danny Connor, Leon Williams, Menay Edwards, Eric Mokonzo or Areti Mastrodouka, at York Hall, Bethnal Green in London on Sunday 20th May 2012 are priced £35, £45 and £65 are available on line at www.tkoboxoffice.com or in person at the TRAD TKO Boxing Gym, Gillian House, Stephenson Street, Canning Town, London E16 4SA.